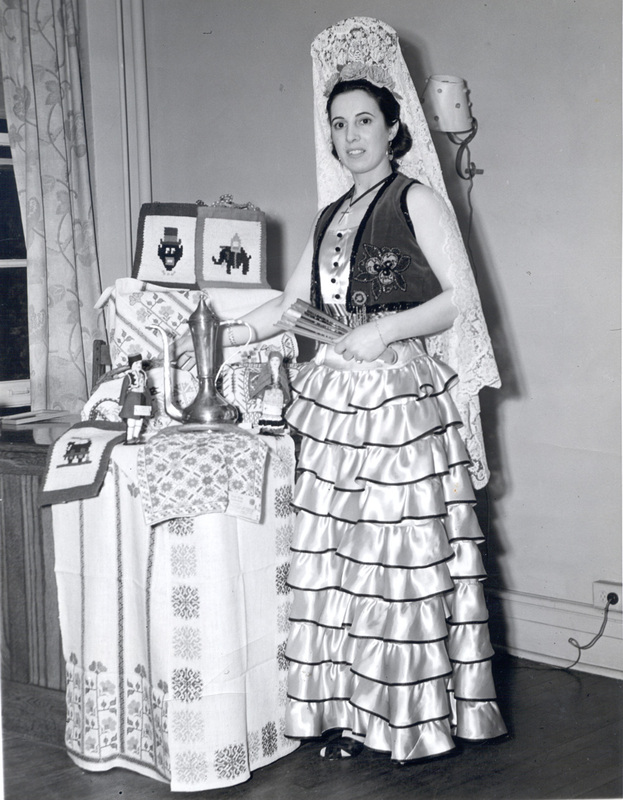 An essay titled Hispanic by Portofino Esparra, Jr.
Natalie Dios wearing Spanish style tiered skirt, embroidered vest, comb and lace veil with fan standing next to a table of artifacts. From the International Institute Collection. The Hispanic presence in the Mahoning Valley is a recent phenomenon. Prior to the early 1950’s the Hispanic (really Spanish) population in the Valley was approximately 200 people. Among the first was Conrado Blasco who settled here in 1914, drawn here by the lure of industrial prosperity. Blasco opened a boarding house on North Watt Street, prospered and then encouraged others to cme. Following him were two brothers, Generosa and Andreas Blasco and others who settled on Wood Street, Rayen Avenue, Summit Avenue, Oak Street, Boardman Street, while some settled in East Youngstown, to be renamed Campbell in 1926. During the 1920’s Jose Moro came to the Valley, settled with his wife in the Brownleewoods area, and raised two children here, both of whom graduated from Youngstown State University. Among the early successful Spanish businessmen was Leoncio Garcia, whose basket factory was on Market Street Extension. As with any group that came to the United States the Spaniards developed informal support groups. They often met at a restaurant at 132 S. Watt Street, operated by Perfecto Lascida, where discussions led to establishing the Spanish American Society. By 1921 there were 100 members with Blasco as president, Dr. Antonio Arrellano as vice president, and Antonio Sanchez Flores as secretary. Other groups that assisted those newcomers were Centro Hispano Moderno and Christ Mission, led by Ray Hagstrom. Both organizations helped the newcomers lean English and to adapt to the American culture. As the Moros and others of Spanish heritage began to adapt to their new environment the next major and most significant group of Hispanics, the Puerto Ricans, had begun to arrive in the Valley. Read more about the Puerto Ricans in the Mahoning Valley tomorrow.